Chicken pot pie recipe – The most delicious and comforting recipe ever! 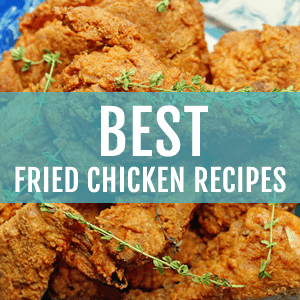 You will want to curl up on the couch next to the fire with a bowl of this! Nothing comforts me more in the winter than chicken pot pie. I adore it! It is a tiny bit more special than a bowl of soup (chicken noodle and tortilla). And it just so happens to take stew to the next level with its flaky buttery crust. This chicken pot pie recipe is one of the only reasons why, other than Christmas, I look forward to the winter. When I was young, there were special Sundays when my mom would pull out all the stops and make her homemade chicken pot pie recipe. 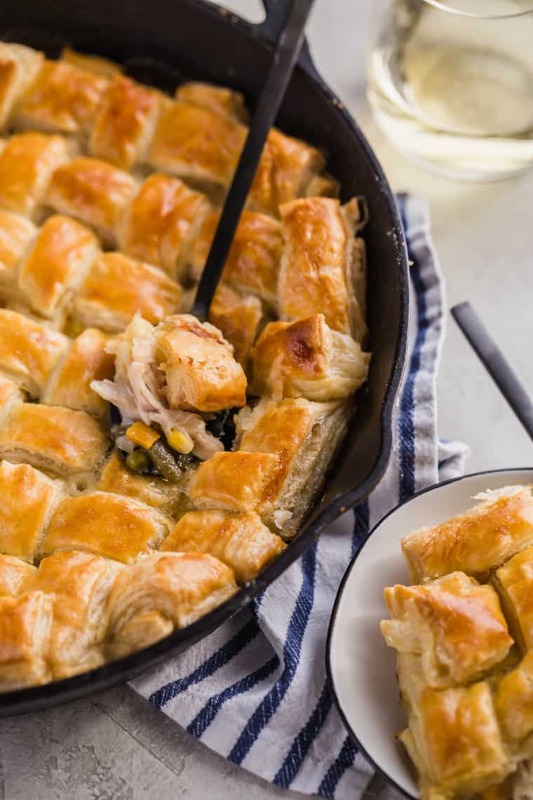 This was considered special because it does take time to create this masterpiece though there are several versions that save time with cream of chicken soups and pre-made crusts. 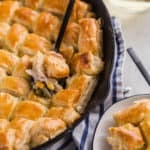 HOW IS THIS CHICKEN POT PIE RECIPE DIFFERENT? us don’t have time to make it but there are some really great all-butter options in the market that taste absolutely heavenly. When it bakes up golden and delicious on top of the chicken stew, it becomes the most sensational thing you can taste. onions (and sometimes potatoes) and let it simmer away in a thickened liquid of chicken stock and a bit of heavy cream. Once everything bakes together, it really is the most comforting meal you can ever make. I dare you to try one this winter season! No special occasion is needed. Do it “just because”. Delicious and comforting chicken pot pie baked with puff pastry. Over medium heat in an oven safe skillet or cast iron skillet, melt butter then add diced onion and cook for 2-3 minutes until it softens and begins to brown. Next stir in flour and continue to cook for 2-3 minutes until the flour browns and a roux begins. Whisk in chicken stock and heavy cream. Next, add in mixed vegetables and shredded chicken. Turn heat down to medium low and cook filling until it has thickened, coating the back of a spoon, and the vegetables and chicken are softened and warmed through. Turn off heat and top the filling with full box of puff pastry. Brush the top of the puff pastry with egg wash of egg and water. Bake for 35-40 minutes until puff pastry is golden brown and filling is bubbling beneath then rest before serving. Your pot pie looks wonderful! Though I am not a fan of chicken, especially the white meat, whenever I make a turkey or a duck, the leftovers go into a pot pie. So rich and comforting. 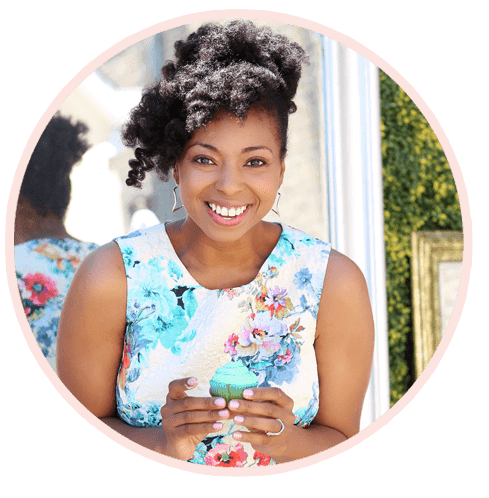 Love your blog and the pictures of your beautiful baby girl. She looks so happy and sweet. Where is the actual recipe? 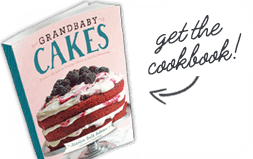 I want to make this but the recipe isn’t showing up with the article. Thanks! Hi Lisa, check again. It was deleted from the post but has been restored now. Thanks for letting me know. Absolutely love your posts and watching the “little princess” grow is adorable!!. We are having a church fellowship with the ladies in a few weeks and I am planning to make this pot pie with a salad and some dessert. It looks rich and filling, I can’t wait to try it. Will keep you posted on the reviews. Keep up your fabulous work, great to see a “woman of color” in this arena…we applaud you!! Hooray and thank you so so much Jayne. That means so much to me! The pot pie looks delicious! Your little girl is the cutest little girl ever! OMG you are so so kind. Thank you so much! I love your recipes. I can’t seem to find the chicken pot pie recipe though. Beautiful pics but where is the recipe? Would love to make this. Thanks! Hi Susan, refresh the page. It should be there. Why have I never made chicken pot pie before??? This looks amazing! 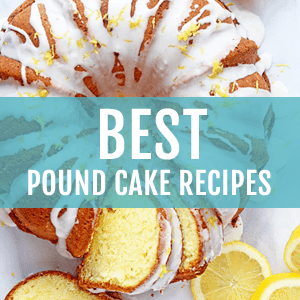 I love classic recipes! This pot pie looks awesome! Great pictures! Can’t wait to try it, pinning! 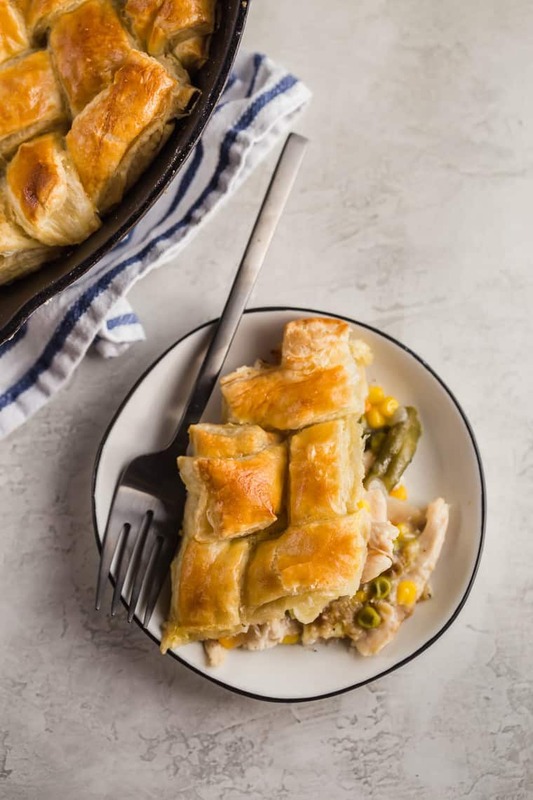 Flavorful chicken and veggies simmered in sauce, crowned with buttery puff pastry, AND baked in a cast iron skillet?!?! Heavenly! ! Jocelyn, I made this today and it was DE-LISH!!!!!! Excellent instructions!!!!! Hooray Tracey! So glad it was so good! Now I need an invite to your house for any leftovers. 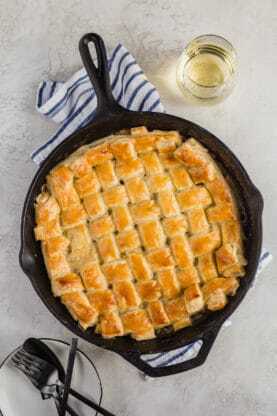 I adore puff pastry on pot pies – it is just SO good! This looks absolutely divine! Pinned! Hooray thanks so much dear! I love making pot pies at home! The best comfort food there is! Love your lattice top! 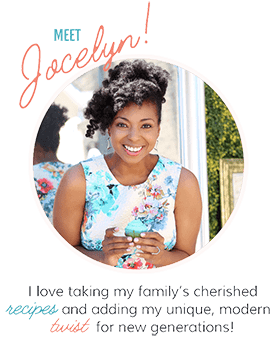 Beautiful, Jocelyn! You’ve just made me SO hungry! 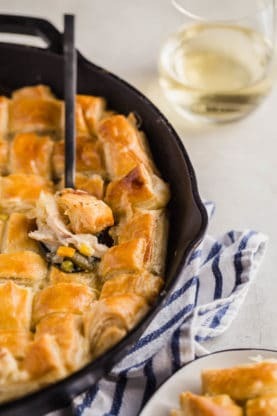 There’s nothing like a good chicken pot pie and your version looks amazing! There’s nothing more comforting than a big ol’ helping of pot pie. Your version looks amazing. Oh my heck, this needs to happen in my kitchen soon. I LOVE pot pies!!! 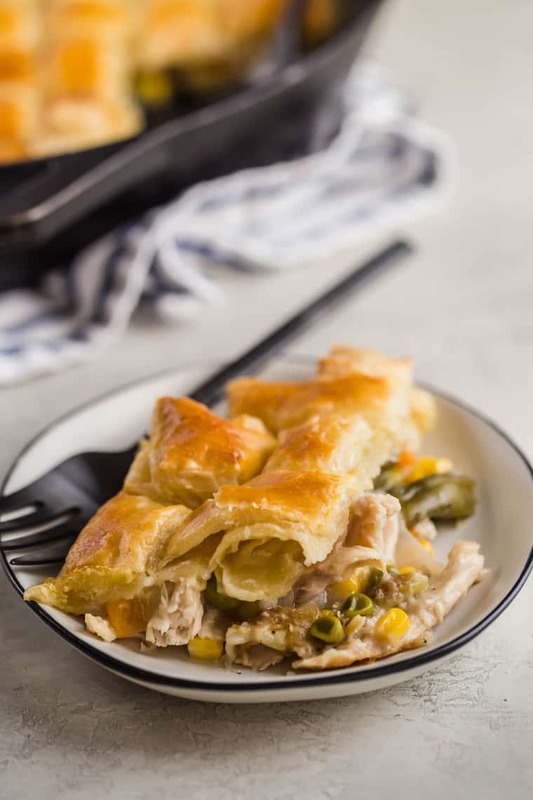 This pot pie looks incredible.. so hearty, flavour filled and comforting. My mouth is just watering looking at the images. Seriously delicious stuff Jocelyn. I love the lattice top! I just want to dig into that pie! And it’s gluten-free to boot? KIDDING. I’m very pro-gluten. And pro-THIS. Thanks so much Julie!! Who doesn’t love a flaky crust? This is THE BEST. Chicken Pot Pie is my jam. Pinned! Heck yes, this pot pie is winning my heart. This is on! This is the prettiest looking chicken pot pie I’ve ever seen! I love how you are carrying on traditions. Aww thanks so much Julianne!! Wow, this chicken pot pie looks absolutely delicious. Oh that crust! Thank you so much Shinee!! Such a beautiful chicken pot pie. The crust is beautiful and perfection! I’m a sucker for a good chicken pot pie and that crust looks sp good and flaky. Love the lattice top on this baby!!! yes to chicken pot pie and all the special Sundays with your mom! Hooray thanks so much boo! It’s totally my comfort food! And the lattice top looks so beautifullll. That is one seriously perfect looking, classic pot pie. I can only imagine how good your house smelled while making this! It was smelling so good indeed Matt! Chicken pot pie is a huge family fave around my house. Your version is absolutely gorgeous! Love the puff pastry twist and that lattice top! Gosh I love it too girl! Thanks so much! I love me some pot pie!! And your time saving tips make it even easier! Yes it is super decadent! I have a leftover roast chicken that is begging to be made into a pot pie! This looks delicious! Yep I love using leftover roast chicken girl! That crust looks incredible. You’re totally right- there are some great puff pastries out there nowadays. Love the latticework you did on the top, too! Hooray thanks so much my dear! Now that was a feat dealing with melting puff pastry on steaming hot puff pastry!! Nothing beats a good classic…this chicken pot pie looks incredible! One word……YUM!!!!!!!! The puff pastry adds the perfect elegance!!!! I adore puff pastry. So delicious!